Yep we have definitely discussed this before it becomes extremely difficult with visas and paying US Tax. Not that they would ever do it anyway regardless. The new season premieres Sept. 27, dividing 18 castaways into three tribes based on the positive attributes assigned to them by others. Not sure if it has been mentioned before: Jeff Probst reveals Rove McManus has tested many challenges before the contestants compete. Could he have also tested the challenges on the Australian version secretly? 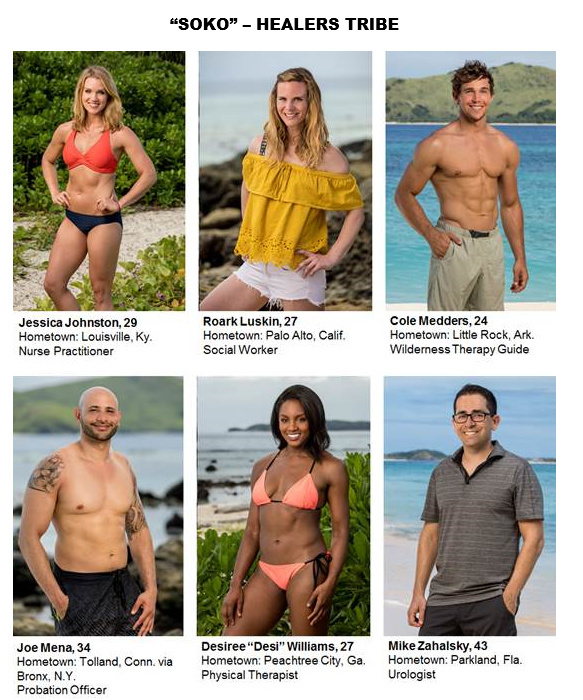 The premiere of Survivor: Heroes v Healers v Hustlers did quite well in the US with a 18-49 rating of 1.8 (down from last year’s 1.9) and total audience of 8.33 million. It is in a very competitive timeslot against Empire, The Goldbergs, Speechless, The Blacklist and The Arrow. The premiere episode was OK but not amazing. I rarely love first episodes as its usually the second episode where we get to know the contestants a bit better I start getting into it. It would have been better if we got a 90 min premiere. As for the Idol twist I thought that was stupid. I can see what they were thinking, obviously hoping to kick the season off with a bit of excitement and an Idol play (which usually don’t happen till later on) although it never eventuated and it was poorly executed. Handing the Idol to someone on the other tribe was just silly. At the very least the guy who found it should have been able to keep it until his first tribal council. From the little we saw so far it seems like an interesting enough mix of people. It seems like 2 or 3 of the guys this season are a bit loopy… I can’t believe the NRL dude made that othe rguy strip down to prove he didn’t have an Idol. That was creepy. At this point Iike Cole and it’s all about Cole. He is stunning. Second ep was much better than the first. At this point I’m putting my money on Ali making it pretty far. I didnt find the second episode that much better. It was obvious from the start of the episode who would be going and they rushed through tribal council. Apparently the post merge part of the game is supposed to get crazy this season so Im holding out for that. And one of them is a famous Aussie presenter. I don’t ever see them doing a Celeb version. Wow last nights ep really kicked this season into gear. Best episode of the season. I loved that they switched tribes rather than go to 2 tribes, pretty sure its the first time that they’ve done that with 3 tribes? It meant there was a mix on every tribe so it was never going to be a straightforward vote. I hope these tribes remain until merge, it should only be a couple of votes away anyway. These new secret advantages only valid at one Tribal have obviously been implemented to still have advantages but not have people hang onto them until the end like last season. At firstI didnt like this advantage but I actually think it was smart to give a player the chance to impact the vote on another tribe. Cole is hot but an idiot!!! So stupid to tell every person on the Tribe about an advantage. Dumb. Awesome TC too. Loved it and shock exit. My faves at this point are Chrissy and Ali. I didnt like the fact that they made the person that got the ’ secret avantage’ think that it was something that could benefit them. The US Survivor episodes feel just so rushed to me now straight after coming off watching our version. It also doesnt help that the cast and the season overall arent that good. I also like Chrissy and Ali and based on the editing so far I think Chrissy will be the winner this season. 100% agree, they feel too rushed. No way. I could not tolerate Aus Survivor due to the length. We could have maybe benefited from a 90 min premiere to get to know the contestants a bit better but otherwise im satisfied. Faster paced and tighter editing is way better. You dont need a tonne if filler pre-merge. Last nights episode for me was better than most Aussie ones and im liking the cast this season. Many of my friends had been US Survivor virgins (despite encouragement) but were keep to try it after the Australian versions. I have given then some previous seasons to watch and they started watching the current US season. The most surprising observation is that the US version looks cheaper than the Australian one - all agree! Generally they don’t like the US version - with 43 minutes per episode after adverts - take out the recaps and there is not much story telling time available to get an insight into the contestants. Last episode was typical, who was who, why did they ignore the potential of an idol? but generally because of their limited screen time - who cares? Perhaps later in the season, the characters might become more memorable, but by then the season will be almost over. I had the opposite reaction with my sister. She loved the last season of Australian Survivor (as did I). I gave her a few seasons to watch of the US version and now she can’t get back into the Australian version due to its length. To me it isn’t so much about the length of the series rather than the length of the episodes. If it was 26 episodes at 43 minutes I would fine. Its because they are 70 minutes episodes. Yeah same reaction with my friends. I have a group of friends and this year we decided to do “Survivor” nights so we all watched it together every Sunday. They were never really into the US one but because I was always comparing them I have since told them some of my fave US seasons which they are binge watching now. They finally agree with me how I was always going on about how long and unnecessarily drawn out the Aussie one was. It all comes down to what you are accustomed too I guess. Some of you probably feel more “invested” in Australian Survivor because it took so much more time out of your lives so you were more involved. People generally just prefer Aussie versions of shows but there is simply no way in hell that Australian Survivor is anywhere near the quality of the US. The challenges are good but much more amateur. Every single episode of Aus we had the exact same island footage and same snippets of waves hitting rocks. The first thing I noticed when this new US season began was how superior the island shots and camera work are. It’s what really sets it apart for me. Also for me Survivor usually gets exciting at the merge. It’s a show that starts to build in the first few episodes and each episode snowballs as the game gets further. I could not handle 15 pre-merge episodes of Aus Survivor and the same people saying the same things all the time. There was just so much unnecessary filler. We also don’t need to invest too much time into people that are early boots. It’s pointless. Tight editing and faster pace is definitely preferable to me. Really good episode last night. Chrissy is proving to be a really strong player and my clear favourite at the moment. I can see strong players on all tribes. 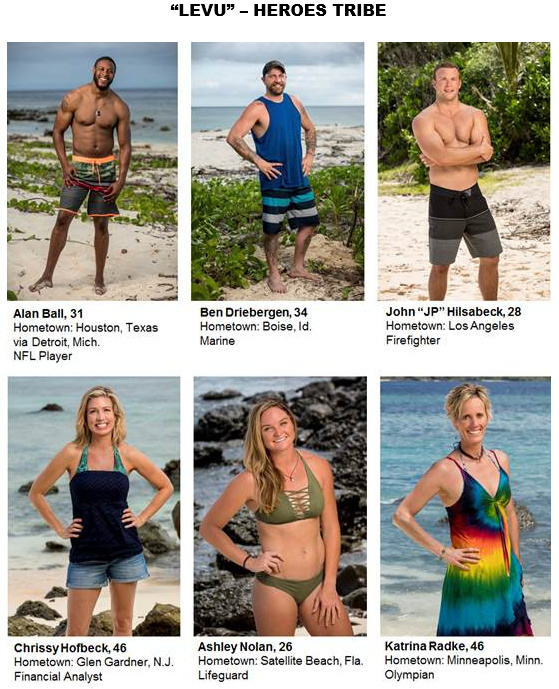 I do find it a little hard to keep track 3 tribes since the swap as the ones that never go Tribal dont really get airtime and its sometimes hard to remember who was originally where. I think it will be a first going to a merge from 3 tribes though so might be why this season is rumoured to be a crazy post merge. I reckon the ep after next will be merge. I don’t know what it is but I just can’t seem to get into this season. Theres very few players I care about this season.